Prizes for the best ideas were from Ajujaht, Tartu City Government and Tartu County, NGO Heade Mõtete Klubi of the alumni of the Faculty of Economics and Business Administration, Viljandimaa Municipal Governments Association and training company Leoski Koolitus. The first prize of the competition was by UT Idea Lab—participation in the international Founder Institute Estonian programme, which offers training for start-up founders. The first prize of the competition, participation in the Founder Institute programme, went to the role-play based solution Bizplay, which helps develop entrepreneurial knowledge and financial skills by using curricula and online tools. 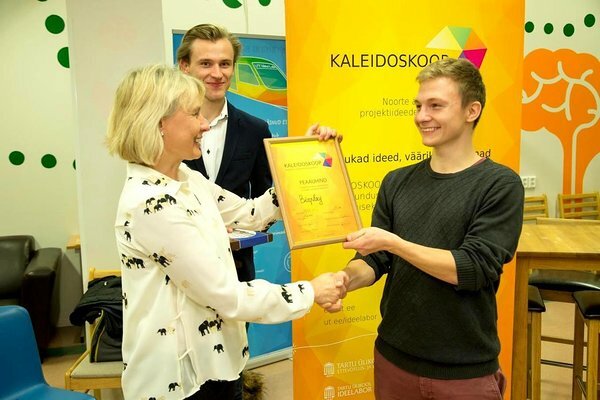 According to a member of the winning team, UT student of entrepreneurial economy Uku Lilleväli, winning Kaleidoskoop was a big surprise because there were many great ideas and projects. “The chance to participate in the Founder Institute programme will definitely help us with developing Bizplay, bringing it to the market and promoting entrepreneurial education,” said Lilleväli. Tartu City Government’s award went to 3D Creationist, which is based on 3D modelling in smart phones. The team intends to use the prize money to finance patenting their idea in the USA. Tartu County prize receiver HireYoung plans to use their award money to adapt their service for the Estonian, Ukrainian, Polish and German market. The aim of their project is to create a successful online platform which helps young people with no prior working experience find internships and future jobs and save enterprises time, money and effort in hiring them. The award by Ajujaht went to team Laser, who presented their idea on laser-cut commodities. RuutjuurKolm won the prize of Heade Mõtete Klubi for their board game based on the UT Museum Crazy Scientist’s office. Liina Joller’s special prize for eco-innovation went to WASHD, whose project is about flexible bicycle rent in Tartu. Viljandimaa County Association awarded team Triin6, whose project focuses on Triinu handicraft and bakery shop. The special award by Leoski Koolitus went to student company Bison, who presented their project about making bags for college caps. The jury comprised UT Vice Rector for Development Erik Puura, Vice Mayor of Tartu Kajar Lember, Head of Development and Planning Department of Tartu County Government Margus Hendrikson, former CEO of Playtech and founder of Contriber, Garage48 HUB Tartu and Contriber Labs Rein Lemberpuu, CEO of Estonian Business Angels Network Heidi Kakko, Business Consultant at Tartu Centre for Creative Industries Juta Kuhlberg, and team leader of Ajujaht Harri Tallinn. A total of 19 teams participated in the competition. This included students from UT Faculty of Economics and Business Administration, Faculty of Mathematics and Computer Science, Faculty of Science and Technology, Faculty of Social Sciences and Education, Pärnu College, and Viljandi Culture Academy and students from Tartu Art College and Tartu Art School. There was also one student company, a team from Tartu Vocational Education Centre and several secondary school students. All teams had the chance to further develop their business idea together with business mentors and join UT Idea Lab or other business incubators that participated in the event. Additional information: Maret Ahonen, Head of UT Idea Lab, tel, 737 4817, 5225910, e-mail: maret.ahonen@ut.ee.